Seven different plants that are symbolic of the Jewish faith are depicted in this lovely design by Nancy Rossi. The motif in the center of the design is the Partridge. 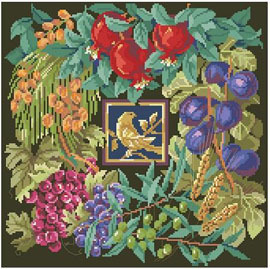 This may be worked in Counted Cross Stitch or Needlepoint and finished in a variety of ways to make that special heirloom piece. Contents: Stitch Count 169w X 169h, Finished Size on 14ct: 12" X 12"